Many technologies evolve almost daily to hit the digital world. Among them, AR or Augmented Reality is rapidly expanding the horizon of eCommerce industry. According to Gartner, AI will handle more than 80% of total customer interactions. Exploring online space and resolving the eCommerce challenges have become an easy breeze with the evolution of AR. Use of Augmented Reality in eCommerce has redefined shopping in a jiffy. If you’re planning to unleash its potential to drive sales, this blog is for you. Get ready to learn how. 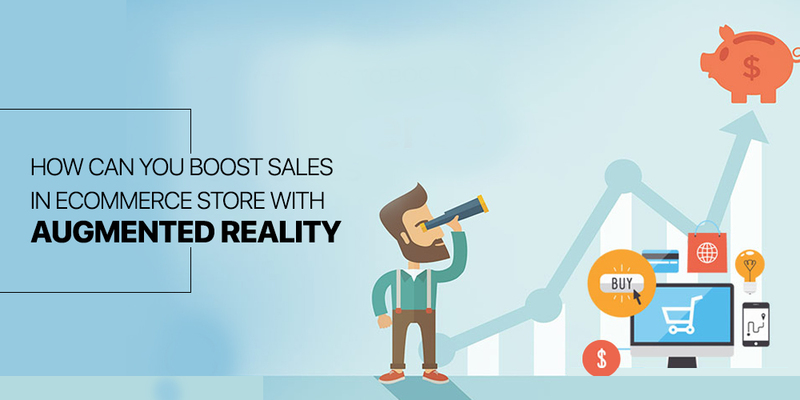 How Augmented Reality in eCommerce Boost Sales? Engages Your Visitors: Your prospective customers feel more connected when they see their products in 2D image forms. They can look at the products closely. As a result, they will visit the store again and again. Tells Stories: It introduces a digital platform to help owners share some industry-relevant stories. Therefore, the users feel encouraged to actively participate in product promotions and other related events. Increases Curiosity: AR experiences stir up curiosity in your targeted audience. As such, the visitors come time and again to experience it. AR motivates and appeals to the users in a way that they begin to take genuine interest in your products. Shapes Decision: 3D visualization in AR enables your users to take right decisions by making them to look at the product from different angles. Thusly, it brings down the return rate of the purchased items. Personalizes: Personalization is another great feature that came with the introduction of Augmented Reality in eCommerce. Earlier, it wasn’t possible to wear a dress available online to see whether it suits you before buying. But, with the coming up of AR, your users can see themselves in different outfits they intend to buy. Why Should You Include Augmented Reality in eCommerce Store? AR supports and guides the shoppers. Therefore, your customers will get the exact information that further helps them in taking decisions. AR will guide them to pick the best from available options. In some eCommerce stores, there’re virtual salespersons helping customers to shop for the right product. Designs and sizes matter a lot in online shopping. For that, the store owners need to integrate the real-life products into projected images. And, that’s possible only with the use of AR. It engages your shoppers to browse for products more. As the introduction of AR has customized shopping experience, shoppers no longer need to compromise with their choices. Knowing virtual dimensions and colors of products has also enhanced the users experience to a large extent. AR has occupied a significant place in the world of eCommerce. It is increasing the conversion rate and driving ROI. But, at the same time, you’ve to use it judiciously. However, any reputed eCommerce store development company can help you to do that.